We should strive to be faithful in small things to prepare ourselves for the greatest. Suzanne Aubert loved Sacred Scripture. Her Directory is full of Scriptural texts in support of her instructions. She wrote: “The obscure and inglorious task of education is the greatest of human tasks”. (Directory 23, page 282) Guiding young people in the ways of God gave her tremendous joy. Let us speak to God about our miseries, all our needs, all our pains. We cannot speak to Him too freely, nor with too much confidence. Let us tell Him all that we have in our heart, our joys, our desires, our repugnance’s, our weaknesses, our sins. We shall never exhaust the subject matter. To love God above all things, to love all people as oneself, to give one’s heart and soul, one’s mind and strength in order to make people better and happier, that is life, that is the law, that is happiness, justice and truth. Written in one of Suzanne Aubert’s notebooks. Be happy in your dear family and may you with them enjoy every blessings. Aubert (on behalf of pupils of Nazareth Institution) to Lady Bowen, 2 May 1898, ACDA POM 23-4, Page 14. Prayer can bring results where doctors’ skills fail. Aubert to Outhwaite, 30 July 1872, Sisters of Compassion Archives. 54A. In the eyes of God there’s no Nationality. Aubert to Outhwaite, 16 July 1873, Sisters of Compassion Archives 54A. May the Holy Will of God be done and blessed be His ways. Aubert to Outhwaite, 11 Sept. 1874, Sisters of Compassion Archives 54A. Are not God’s ways mercifully wonderful!! Aubert to Bridget, 9 July 1918, Sisters of Compassion Archives. If we never look for gratitude we shall never be deceived. (Message written by Suzanne Aubert included in a letter written by Sister Baptista to Sister Bridget, 11 August 1907. Sisters of Compassion Archives 23C/87. Do not loose courage, pray hard and God will arrange everything. Aubert to Sister Bridget, undated [c. November 1903}. Sisters of Compassion Archives 23C. Caution must be taken not to write anything that may lead any one to surmise things that ought to be buried in oblivion for ever. Aubert to Sr. Carmel, undated , Sisters of Compassion Archives 23A. Bad tongues ought to be let wag like dog’s tails without taking notice of them. Aubert to Sr. Carmel, 9 July 1905, Sisters of Compassion Archives 23A. Do all for God’s sake alone. Aubert to Sr. Bridget, undated [late 1905], Sisters of Compassion Archives 23C. Seek God alone and live in charity, faith and self- sacrifice. Aubert to Sisters, 2 August 1913, Sisters of Compassion Archives 25A/16. To know the plain honest truth: Nothing is worse than uncertainty. Aubert to Isa Outhwaite, [27 October 1913], Sisters of Compassion Archives 15/2. A joyful start to the new day, and may the day itself be happy, and many more that follow. Aubert to Isa Outhwaite, [27 October 1913], Sisters of Compassion Archives 15/2. Trust all the more in God. Aubert to Sr. Angela, 9 January 1914, Sisters of Compassion Archives 22/2. When I have done all I could, I will have done all I ought, and God will please Himself. Welcome and blessed be His Holy Will. Aubert to Sr. Angela, 9 January 1914, Sisters of Compassion Archives 22/2. We cannot be in better hands than God’s own ones. Aubert to Sr. Carmel, 23 February. (Annotated: 1914), Sisters of Compassion Archives 23A/41. Love to cultivate the virtues of Our Blessed Mother, and may they creep in, and around your hearts. Aubert to Sr. Chanel, 20 March 1914, Sisters of Compassion Archives 21C/2. These are the things which I recommend you to stick to, viz. to God, to prayer, to trust in God. Aubert to Sr. Chanel, 20 March 1914, Sisters of Compassion Archives 21C/2. A single lighted candle lights another one, and so on, thousands of candles are lighted. Aubert to Sr. Claver, 9 August 1914, Sisters of Compassion Archives 24B/4. A heart burning with the fire of true charity lights it in other hearts, for it is contagious. Aubert to Sr. Claver, 9 August 1914, Sisters of Compassion Archives 24B/4. Do all you can and trust firmly in God Who will do the rest Himself in His own ways, and you will marvel at the results. Aubert to Sr. Claver, 9 August 1914, Sisters of Compassion Archives 24B/4. Courage, loose heart by no means: Let us pray hard for one another collectively and individually. Aubert to Sr. Claver, 9 August 1914, Sisters of Compassion Archives. We can foresee nothing. God alone knows where we are going to. Aubert to Isa Outhwaite, 22 February 1915, Sisters of Compassion Archives 15/14. May St Joseph obtain for you every blessing and grace. Aubert to Sr. Claver, 2 March 1915, Sisters of Compassion Archives 24B/7. Work is a great blessing. I appreciate it more than ever. Aubert to Isa Outhwaite, 4 April 1915, Sisters of Compassion archives 15/15. Trust in God, seek Him alone. Aubert to Sr. Angela, 12 July 1915, Sisters of Compassion Archives 22/17. The love of God and of His Holy Will is the only real comfort we have in this life; it is even the beginning of heaven, for what is heaven, [if not] the love and the possession of God. Aubert to Sr. Dolores, 16 June 1916, Sisters of Compassion Archives 25C/2. Wish with all your heart that the Holy Will of God is done in us as it is in heaven and all will be well. Aubert to Sisters, 6 November 1916, Sisters of Compassion Archives 24B/25. You need much tact and prudence, but trust in Heaven, it will help you, have courage. Aubert to Sr. Claver, 23 November 1917, Sisters of Compassion Archives 24C/11. What are the designs of God? For nothing happens without His permission. Aubert to Pearl Dalziell, 11 September 1917, Sisters of Compassion Archives Ms Copybook 14B. Let us return fervent thanks to God for His Mercy. Aubert to Sr. Claver, 22 November 1918, Sisters of Compassion Archives 24D/10. Be of good cheer in serving God faithfully. Aubert to Sr. Claver, 22 November 1918, Sisters of Compassion Archives 24D/10. Courage all for God. Auber to Sr. Claver, May 1919, Sisters of Compassion Archives 24D/12. Offer all your pains to God and he will reward them all. Aubert to Kenny, 19 February, 19 February 1918, Sisters of Compassion Archives Ms Copybook 11. Say a little prayer to St Joseph every day, he will protect you. Aubert to Kenny, 19 February 1918, Sisters of Compassion Archives Ms Copybook 11. Never let your right hand know what you left hand is doing. Sister Angela to Suzanne Aubert, January 1916, Sisters of Compassion Archives Ms Copybook 14 C2, p.27. It is wonderful what a temporary absence can sometimes achieve. Aubert to Pearl Dalziell, 11 January 1913, Sisters of Compassion Archives 69/11c. Have courage, look forward for happier days. Aubert to Pearl Dalziell, 11 January 1913, Sisters of Compassion Archives 69/11c. Cultivate that sweet flower of hope the roots of which being in Heaven, always tend to raise us up, reminding us that all our troubles are only transitory, and are made worst or lighter according to the degree of importance and attention we attach to them. Aubert to Pearl Dalziell, 11 January 1913, Sisters of Compassion Archives 69/11c. When you feel the prickling of the thorns remember that roses grow also on the same bush. Aubert to Pearl Dalziell, 11 January 1913, Sisters of Compassion Archives 69/11c. My heart has never left the Māori. Aubert to Sr. Baptista, 27 October 1922, Sisters of Compassion Archives 5. Do all for God and for God only. Aubert to Sr. Bertha, 3 April 1923, Sisters of Compassion Archives 25. Often ask your Guardian Angel to assist you when you are studying. He can help you such a lot if you only ask him, and as he is always by your side you do not need to wait for him, He will be but pleased to help you. Aubert to Sr. Veronica, 6 November 1923, Sisters of Compassion Archives 25G/20. A little from the poor of good will is far more valuable than rich presents from those who have plenty and often give more from show than from the heart. Aubert to Sr. Veronica, 6 November 1923, Sisters of Compassion Archives 25G/20. Let us all be happy in conforming ourselves to God’s Holy Will, and let us all pray earnestly one for the other. Aubert to Sr. Veronica, 6 November 1923, Sisters of Compassion Archives 25G/20. I send you a bundle of ‘arohas’ for distribution. Aubert to Sr. Veronica, 6 November 1923, Sisters of Compassion Archives 25G/34. The legacy Suzanne Aubert left the Sisters of Compassion is a life lived in trust and faith in a God who answers us-always. This God leads us to the poor: be it across the equator or right on our own doorstep. Metaphorically speaking, Suzanne took a giant leap of faith when she came to Oceania, New Zealand. The Suva Community, The Legacy of Suzanne Aubert, in Sacred Seasons with Suzanne Aubert, vol 2, No 4. Suzanne Aubert speaks to each one of us about the importance of having a balance in our lives. In the midst of mass media with so much happening at such a pace we need to take time to nourish ourselves both bodily and spiritually in order to look beyond ourselves. In this way the compassion of God becomes alive in a sometimes complicated life where only a few things are important. The Legacy of Suzanne Aubert, in Sacred Seasons with Suzanne Aubert, vol 2, No 4. In the parable of the Good Samaritan Jesus shows us who our neighbour is. Our caring, kindness and compassion is for anyone in need, regardless of ethnicity or creed. Suzanne Aubert’s policy of care was for those of ‘all creeds and none’. This tradition continues today in the mission of the Sisters of Compassion. Suzanne Aubert came to New Zealand to be a missionary among the people of this land-with a special care for the Māori. 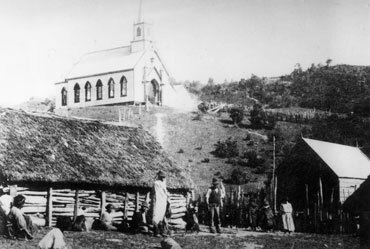 In 1870 when asked by Bishop Croke to abandon this call and return to her homeland, due to Auckland’s financial problems, she declined saying ‘My Lord, I came here for the Māori; I will die in the midst of them. Nobody can prevent me from doing that…’ (Sr. Angela, ‘Reminiscences’, vol. 2, page 294). This decision eventually led to the founding of New Zealand’s own congregation of Sisters.